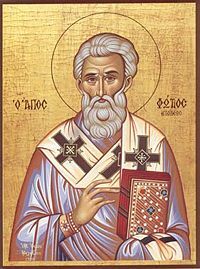 Saint Photius, or Saint Photius the Great (Greek: Φώτιος, Phōtios) (c. 820 – February 6, 893) was Patriarch of Constantinople from 858 to 867 and again from 877 to 886. He is a major saint in the Eastern Orthodox Church. A respected teacher and bureaucrat in Constantinople, Photius was appointed to the patriarchate in the midst of a political struggle in the imperial family which resulted in his predecessor, Ignatios, being deposed. The controversy widened when Ignatios' supporters appealed to the pope and was complicated by jurisdictional conflicts regarding the newly converted churches of Bulgaria. Mutual excommunications followed, with Rome accusing Photius of being improperly ordained and Photius condemning the pope for supporting the insertion of the filiogue clause into the Nicene Creed. The murder of Emperor Michael III resulted in Photius' banishment and Ignatios' reinstatement. However, the papacy's hopes for a more cooperative partner proved futile, and after the Ignatios' death, Photius was reinstated. He eventually gained legitimacy in the West and East alike, although the circumstances of his later retirement are clouded. A prolific writer, he left many important works, especially his Myriobiblon, a compendium of 280 volumes which preserves numerous otherwise lost works of antiquity. Still unrecognized as a saint in Western tradition, he remains one of the most venerated religious figures in Eastern Christendom. His feast is celebrated on February 6. Though little is known about Photius' family, his father was related to Patriach Tarasius, who had served as bishop of Constantinople from 784 to 806, and his mother was related to Empress Theodora and her powerful brother Bardas. Photius was also a relative of the Patriarch John VII Grammatikos (837-843). During the Iconoclasm controversy, Photius' parents had been banished from the capital because of their support of the use of icons, and Photius joined them in exile. As soon as he had completed his own education, Photius began to teach grammar, rhetoric, divinity, and philosophy during the regency of Theodora, whose young son Michael III was still too young to rule. Although he was not ordained as either a priest or a monk, he attracted numerous students both as a theologian and as a teacher of science and rhetoric. The way to public life was opened for him by the marriage of his brother Sergios to Irene, a sister of the Empress Theodora. Photius thus became a captain of the guard and subsequently chief imperial secretary (prōtasēkrētis). At an uncertain date, he also participated in an embassy to the Muslims. It was during this time that he probably began the composition his Myriobiblon or Bibliothēkē, a compendium of Greek literature, which ultimately came to contain more some 280 entries. Photius and Michael III place the veil of the Virgin Mary into the Black Sea. Photius was promoted to the powerful position of patriarch of Constantinople as a result of dissension between the current occupant of the office, Ignatios, and Theodora's brother Bardas. Ignatios' position weakened after the young Emperor Michael III and Bardas removed Theodora from influence in 857. Ignatios was arrested and imprisoned in 858, and when he refused to resign his office, he was deposed. Photius was inducted into the priesthood and quickly installed as patriarch on Christmas Day. Ignatios, however, still refused to abdicate, and his supporters, such as the austere Studite monks, appealed to Pope Nicholas I on the grounds that Ignatios' deposition had no legitimate ecclesiastical basis. Photius' insistence on the Byzantine patriarchate's jurisdiction over the growing dioceses of the Slavonic nations became an additional bone of contention with the papacy. Photius meanwhile enjoyed popular support in Constantinople. 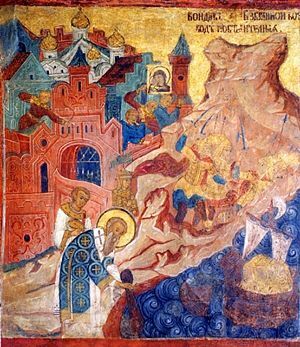 During the Rus-Byzantine War of 860, the legend arose of a miracle in which Photius and the young Emperor Michael III put the veil of the Virgin Mary into the sea to invoke divine protection against the attacking Rus'. A tempest then arose which dispersed the boats of the Rus' "barbarians." In 863, the pope anathematized and deposed Photius, continuing a long and unfortunate history of conflict between Rome and Constantinople. The famous filioque clause—regarding the relationship of Christ and the Holy Spirit—entered the controversy in 867, when Photius cited it as proof of Rome's habit of overstepping its proper limits not only in matters of church discipline but also in theology. A council at Constantinople was soon convened with over 1,000 clergymen attending. This synod excommunicated Nicholas I, condemning his claims of papal primacy, his interference in the newly converted churches of Bulgaria, and the addition of the filioque clause to the western version of the Nicene Creed. 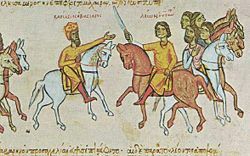 The balance of political power in Constantinople had already begun to shift, however, with the murder of Photius' patron Bardas in 866. Emperor Michael III was killed in 867 by his colleague Basil I the Macedonian, who now usurped the throne. Photius was removed from his office and banished about the end of September 867, and Ignatios was reinstated on November 23. Basil I the Macedonian (left) and his son Leo IV. Despite the pope's hopes for a more willing partner in Constantinople, Ignatios now followed a policy not very different from that of Photius, and the schism continued. Relations between Ignatios and Photius, meanwhile, seem to have improved. Around 876, Photius was suddenly recalled to Constantinople and entrusted with the education of the emperor's children. On the death of Ignatios in October 877, Photius, after the requisite show of reluctance, was restored to the patriarchal throne. Photius now obtained the formal recognition of the Christian world in a council convened at Constantinople in November 879. With Rome in need of aid against the Muslim attacks on the coastal areas of Italy, the legates of Pope John VIII attended, prepared to acknowledge Photius as legitimate patriarch, a concession for which the pope was much criticized by elements of the Western Church. For his part, Photius still refused to compromise on the main points at issue: The ecclesiastical jurisdiction over Bulgaria and the introduction of the filioque clause into the creed. During the conflict between Basil I and his heir Leo VI, Photius took the side of the emperor. Consequently, when Basil died in 886 and Leo became senior emperor, Photius again left office, despite the fact that he had been Leo's tutor. Photius went into exile—some say he retired voluntarily, being already old—to the monastery of Bordi in Armenia. From this point own, he disappears from the historical record. The precise date of his death is not known, but it is traditionally marked as February 6, 893. The most important of the works of Photius is his renowned Bibliotheca or Myriobiblon, a collection of extracts and abridgments of some 280 volumes of classical authors, the originals of which are now to a great extent lost. Photius preserved almost all we possess of Ctesias, Memnon, Conon, the otherwise lost books of Diodorus Siculus, and the lost writings of Arrian. His work provides important information on theology and church history, as well as literary criticisms distinguished by keen and independent judgment. Numerous biographical notes are also included, thought to be taken from the work of Hesychius of Miletus. The Lexicon of Photius, published later than the Bibliotheca, was probably largely the work of some of his pupils. It was intended as a book of reference to facilitate the reading of old classical and sacred authors, whose language and vocabulary were out of date. The only manuscript of the Lexicon is the Codex Galeanus, which passed into the library of Trinity College, Cambridge. Photius' most important theological work is the Amphilochia, a collection of some 300 questions and answers on difficult points in scripture, addressed to Amphilochius, archbishop of Cyzicus. Other similar works are his treatise in four books against the Manichaeans and Paulicians, and his controversy with the Roman church on the Procession of the Holy Spirit, centering on the famous filoque clause. Photius also addressed a long letter of theological advice to the newly-converted Boris I of Bulgaria. The chief contemporary authority for the life of Photius is his bitter enemy, Niketas David Paphlagon, who was the biographer of his rival Ignatios. To Catholics, on the other hand, Photius was a proud and ambitious schismatic, a tool of the imperial bureaucracy of Constantinople who usurped the position of Patriarch Ignatios and refused to recognize the papacy's rightful jurisdiction over the newly converted Slavonic churches. The work of scholars over the past generation has somewhat modified partisan judgments. Virtually all now agree on the rectitude of Photius' personal life and his remarkable talents, even genius, and the wide range of his intellectual aptitudes. Pope Nicholas I himself referred to his "great virtues and universal knowledge." It has also been noted that some anti-papal writings attributed to Photius were apparently composed by other writers about the time of the East-West Schism of 1054 and attributed to Photius as the champion of the independence of the Eastern Church. The Eastern Orthodox Church venerates Photius as one of its most important saints. He is also included in the liturgical calendar of Eastern Catholic Churches of Byzantine Rite, though not in the calendars of other Eastern Catholic Churches. His feast day is February 6. Cavarnos, Constantine. St. Photios the Great: Philosopher and Theologian. Belmont, Mass: Institute for Byzantine and Modern Greek Studies, 1998. ISBN 9781884729430. Photius, and Nigel Guy Wilson. The Bibliotheca. London: Duckworth, 1994. ISBN 9780715626122. Simeonova, Liljana. Diplomacy of the Letter and the Cross: Photios, Bulgaria and the Papacy, 860s-880s. Classical and Byzantine monographs, 41. Amsterdam: Hakkert, 1998. ISBN 9789025611217. Whelton, Michael. Popes and Patriarchs: An Orthodox Perspective on Roman Catholic Claims. Ben Lomond, Calif: Conciliar Press, 2006. ISBN 9781888212785. All links retrieved April 27, 2015. This page was last modified on 27 April 2015, at 14:22.